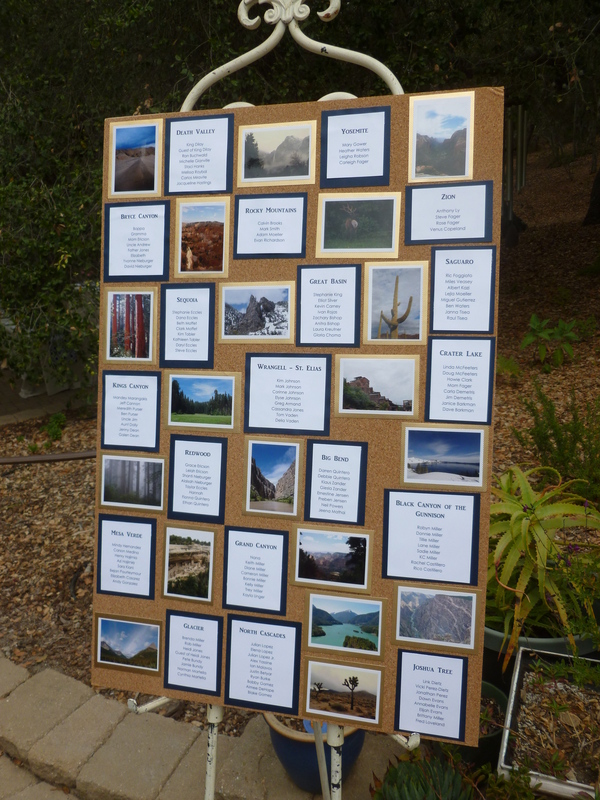 Planning an outdoor wedding in January in Inland So Cal can be a bit risky. January starts our rainy season, drought or no drought. It can also get cold and windy, or it can be beautiful, like a spring day. 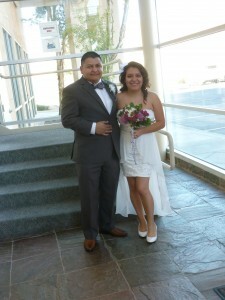 Happily, when a young couple we know married in January, it was the last one. January 18th was warm and sunny and perfect for a wedding. 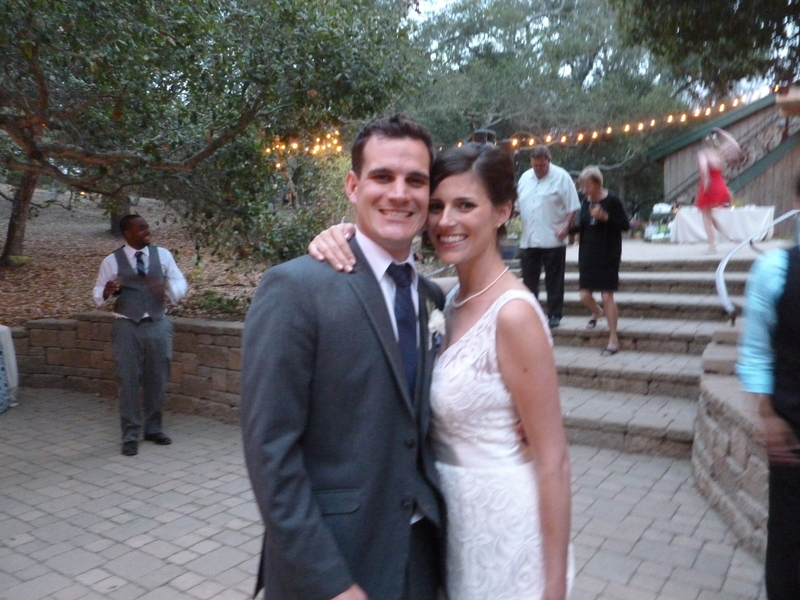 The bride is the daughter of one of Hubby’s oldest friends, from back in Boy Scout days. Happily, we are now wonderful friends with him and his wife, and we were very excited to share in April and Evan’s big day! 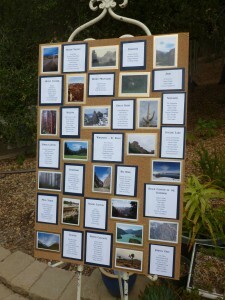 The wedding was held at a ceremony venue called Tennessee Gardens, which is located in Redlands, California. 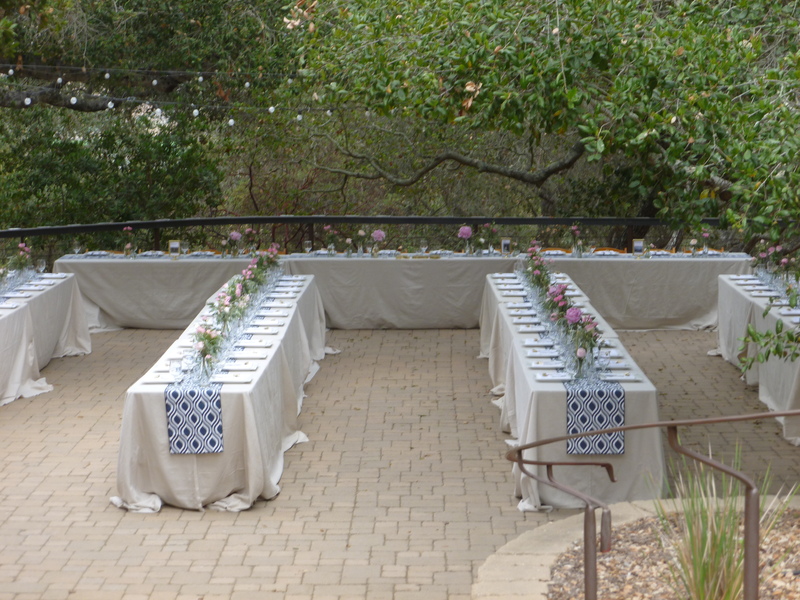 The area where the ceremony was held was right next to the reception area, which made it one stop for the wedding guests, so convenient! The ceremony was held under a white tent which had a gazebo at one end where the bride and groom stood with the minister. You can see from this photo what a lovely day it was. 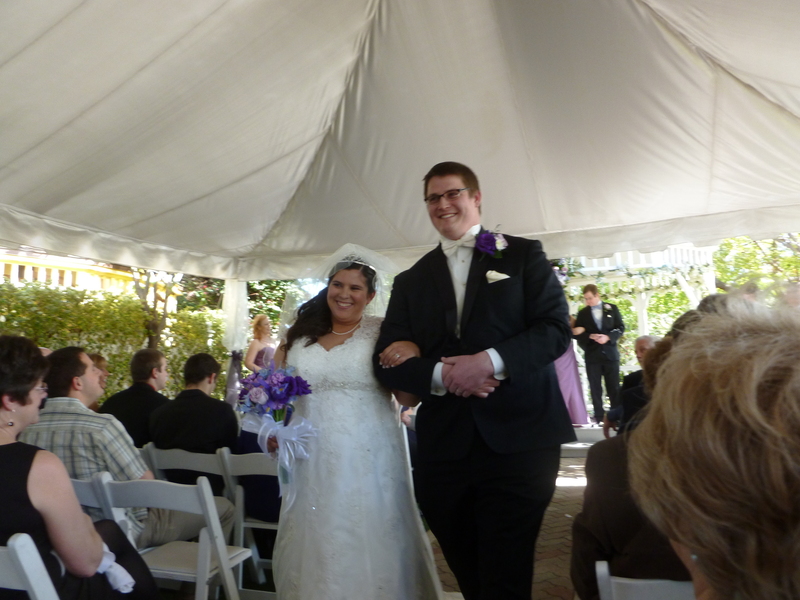 The happy couple, now husband and wife, walked back down the aisle to the theme from “Empire Strikes Back,” which was a fun surprise for all the guests. 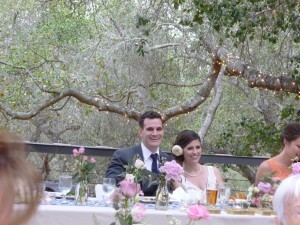 That also helps explain the huge grins on the faces of the bride and groom. That and relief that the hard part was over! 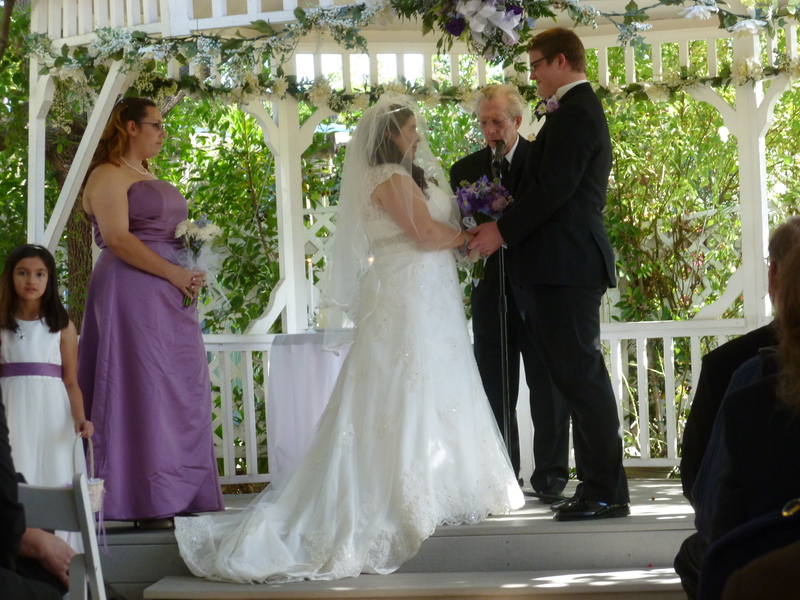 The bride and groom both work at Disneyland and each table at the reception was given the theme of a different Disney movie couple. We sat at the Lady and the Tramp table. 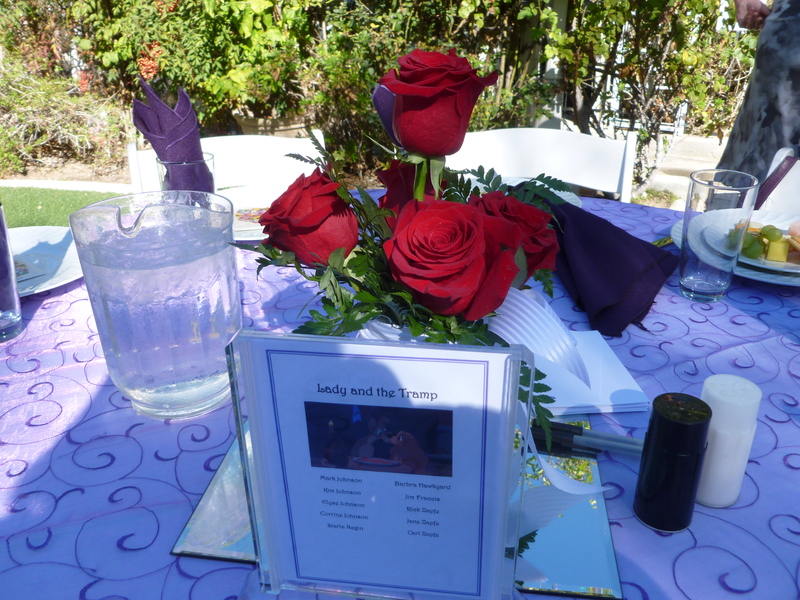 Each flower center piece was different, too, which was a nice touch. 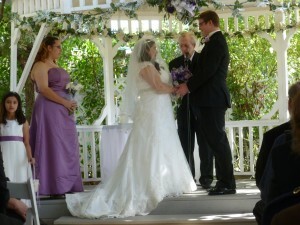 We were seated out under the trees enjoying the wonderful weather. 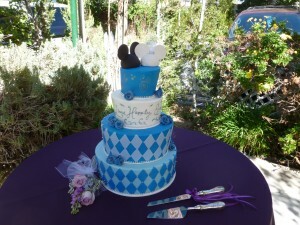 Continuing the Disney theme, the cake looked like something out of Alice in Wonderland. The cake topper was two pairs of wedding themed Mickey Mouse ears. The bride couldn’t find a Disney themed cake topper that she liked so the bakery offered to make the Mickey ears. Aren’t they cute? 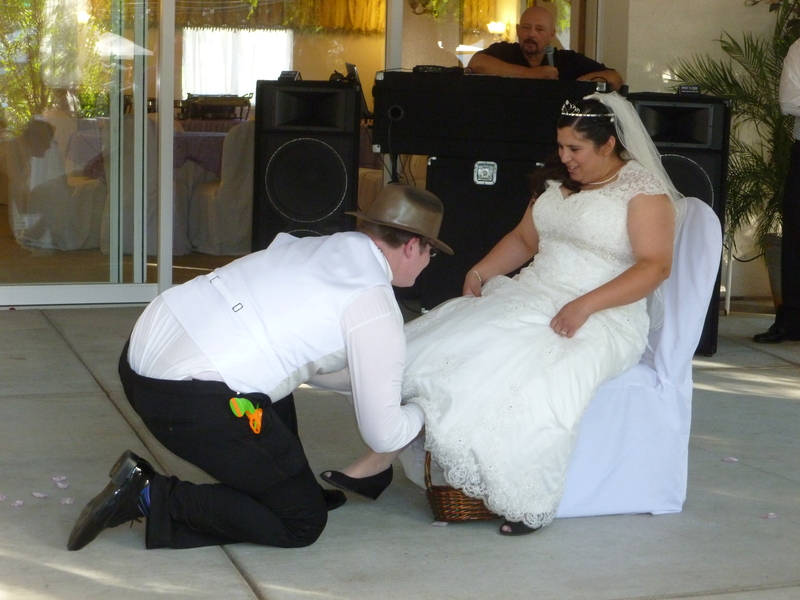 The groom wanted to turn the garter ceremony into something memorable. so he did a take off on Indiana Jones (there is an Indiana Jones themed ride at Disneyland). That explains why the groom is wearing an Indiana Jones style hat while he is taking off the garter. It was pretty funny and imaginative. 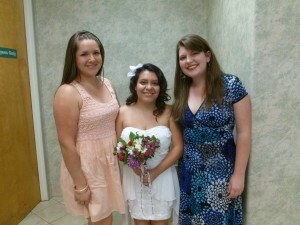 All three of the brides wore their hair off to the side, the right side! This past weekend we went to our third wedding this year (although I just realized I never told you about the wedding in January…I will have to fix that…). 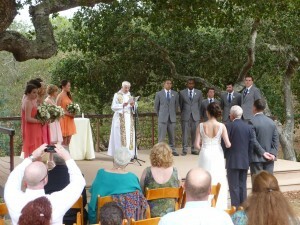 All of the weddings we have gone to have been lovely, different from each other and wonderful! 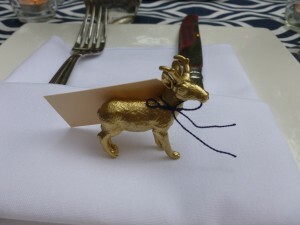 But lets get on to all the delightful details of the most recent celebration!. 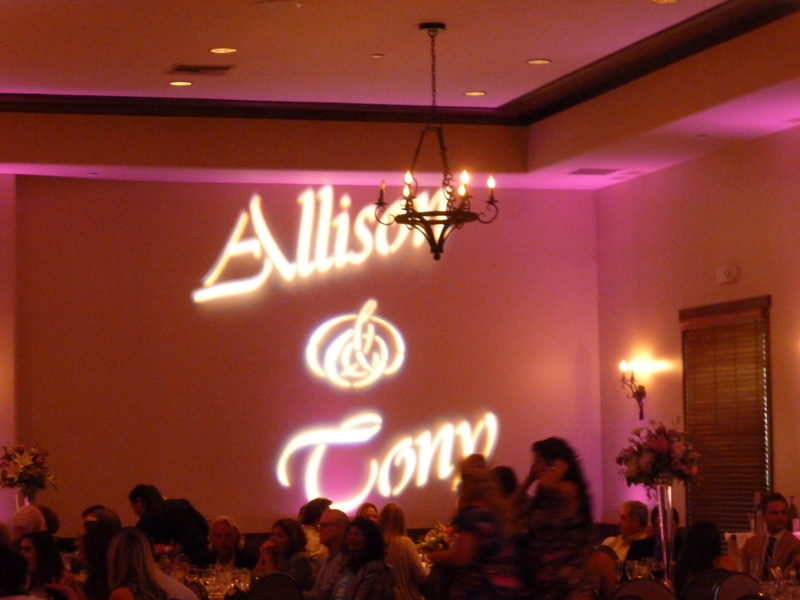 This wedding was for Allie and Tony. 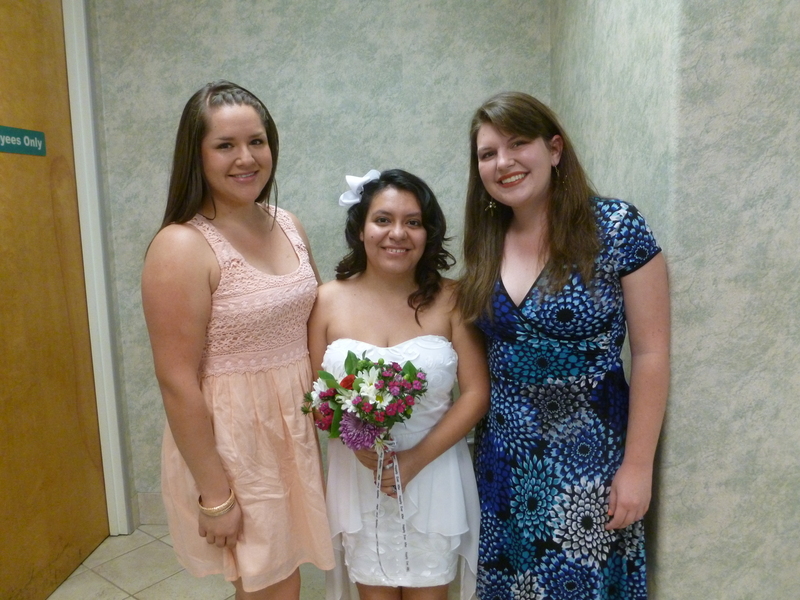 I have been friends with the bride’s mother since high school and have known the bride since she was born. We were seated at a table with some relatives from my friend’s side of the family. My friend’s maiden name and my married name are the same so it took a bit of explaining to the others at the table that we were not related in any way. Family in heart, but not in blood! The wedding was held in a beautiful Catholic church in San Diego called “St. Gregory the Great.” The church is fantastic inside , but I was not taking photos of the church, I was just admiring. 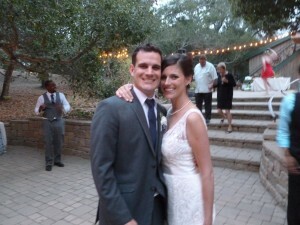 The photo below came from the bride and groom’s website. 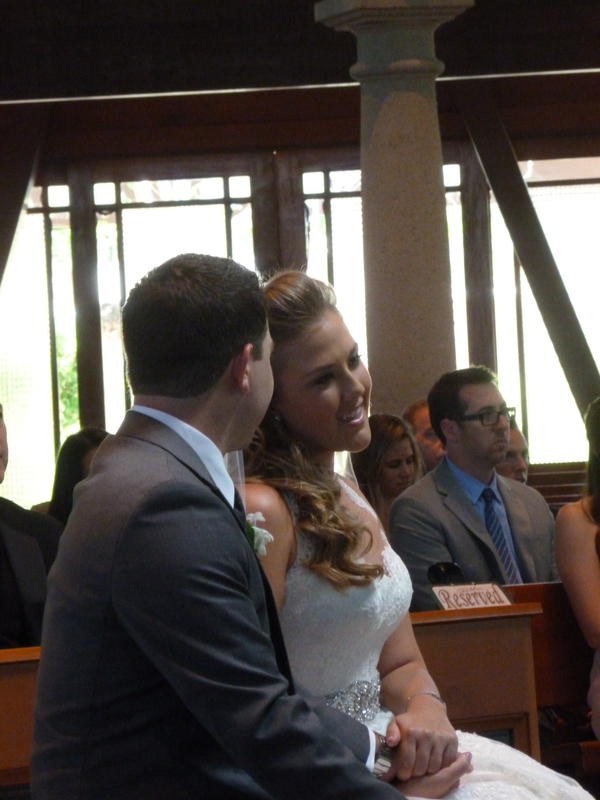 The groom was handsome, the bride was stunning, and I love this photo I took of the two of them during the ceremony. Don’t they look sweet? 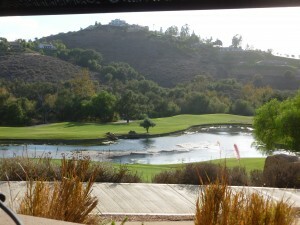 The reception was held at the Maderas Golf Club in Poway. It was a lovely venue. Cocktail hour was outside on the patio, which allowed us to admire the views of the course, lake, and surrounding hills. After the cocktail hour we moved inside for dinner and dancing. 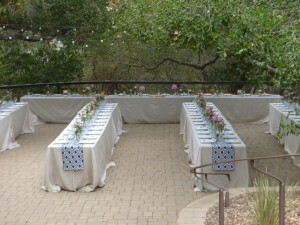 The main color of the wedding was a pretty dusty pink and the flowers on the tables were that lovely soft pink. 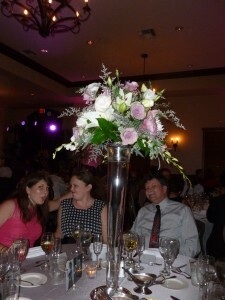 Some tables had high flower arrangements and some had low ones. My table had a high arrangement, which I took a photo of, with my crazy family in the background making silly faces. I didn’t find out about the silly faces until I looked at the photo. Sigh! 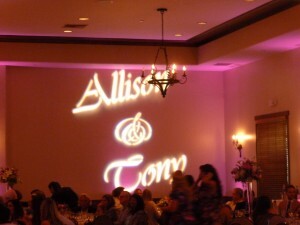 On one wall of the reception ballroom they projected the bride and groom’s names, which we all thought was a nice touch. Dinner was delicious. We had three choices: chicken, salmon, or vegetarian. Between the four of us we had selected all three and I can tell you they were all yummy! I didn’t think to take a photo of dinner, I just dug in and enjoyed! 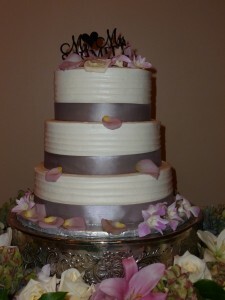 The cake was seriously delicious. We would have taken another piece (or five) in a heartbeat, not that we needed it! 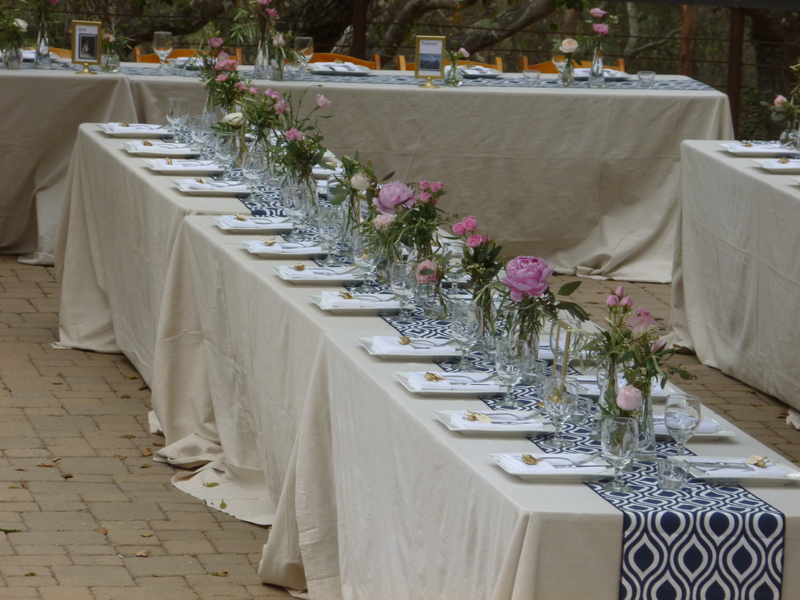 It was surrounded by flowers and highlighted by simple gray ribbons on each layer. 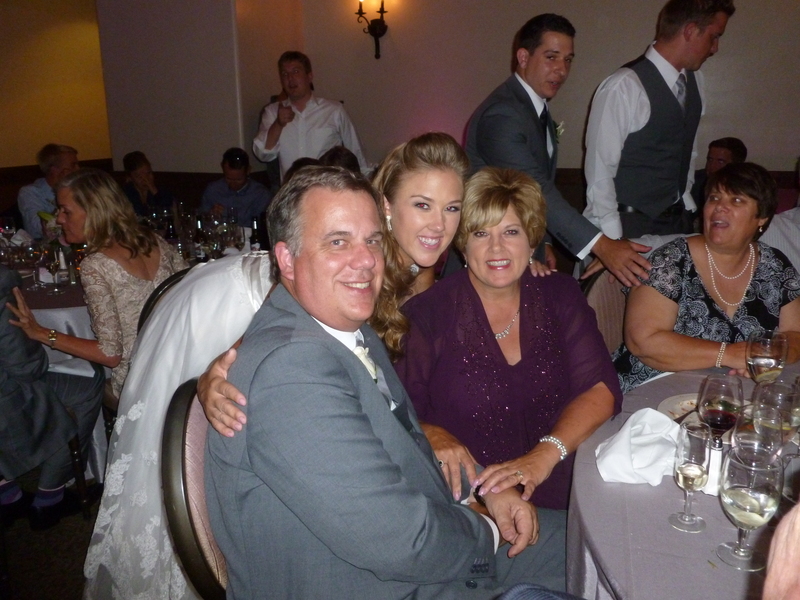 I caught the bride with her proud parents during the reception. The bride and groom are now off on their honeymoon to Greece. We know they will have many wonderful years together!